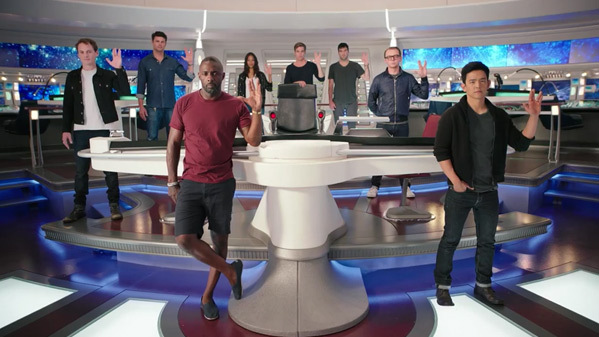 Omaze has launched another short new promo video from the set of Star Trek Beyond. This one is special though, it's a tribute to the late Leonard Nimoy from the entire cast and crew of Star Trek Beyond, being directed by Justin Lin. We've already featured a number of these Omaze Star Trek mini promos before, but this one is worth seeing for all the footage of Nimoy and the love they have for him. The video features most of the cast and is narrated specifically by Zachary Quinto, who plays Spock in this new Star Trek series. The rest is all about collecting money for a charity Nimoy supported, so take a look. Live long and prosper. Here's the new Omaze video for Star Trek Beyond - for more info from Omaze, visit YouTube or this link. Details from Omaze: "The cast of Star Trek Beyond unites to offer one lucky fan the chance to boldly go where no Star Trek fan has gone before: into the movie. In addition to the grand prize, each week we’re randomly selecting an additional winner to form the first-ever, To Boldly Go Crew. The members of this honorary crew will visit the set, hang with the cast, and watch as they film scenes from Star Trek Beyond. Every $10 entry supports nine global causes, each nominated by members of the cast. Check out other once-in-a-lifetime experiences at omaze.com." Star Trek Beyond is being directed by Justin Lin, featuring a screenplay worked on by Simon Pegg. The film is currently set for release on July 8th, 2016 next summer. Never was a huge fan of Star Trek but it is still weird to think that Mr. Nimoy is gone. Even though this is for charity, it still feels wrong that they are schilling his memory and STAR TREK legacy for money. It's for the charity that Nemoy was very close to. I feel confident that plans with Omaze were made before filming even started. If he were alive I'd imagine he'd be speaking to you directly in this video. I'd feel the same way you do if they were pushing a "Pepsi takes you to the Star Trek set" contest. However this is not the case. Decrease salary for actors -> Charity. simple. Add football/soccer player. Repeat.